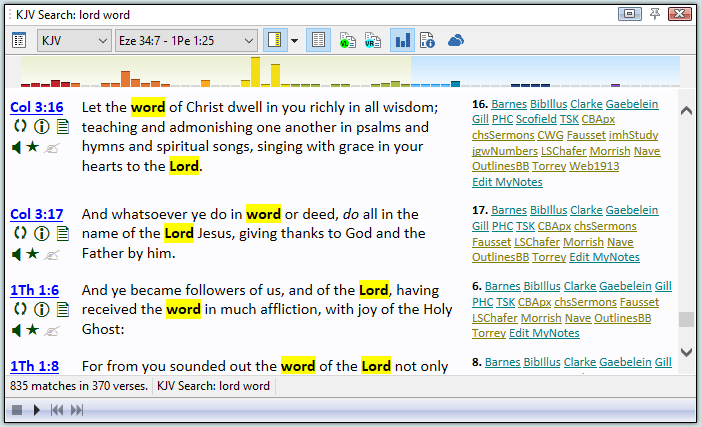 Bible search results are displayed in a Verse List Panel. Other than showing verse lists instead of chapters, a Verse List has the same functionality as the Bible Panel, so it's easy to use verses from a search as a staring point for study. The above example shows the results of searching the Bible for the words "lord" and "word." When a Verse List Panel is displaying Bible search results, more information about the search results is visible by clicking the Search Result Information and Statistics button (the i).